Proceeded by busy viewing days and a large number of book bids, the April stamp auction didn’t disappoint. 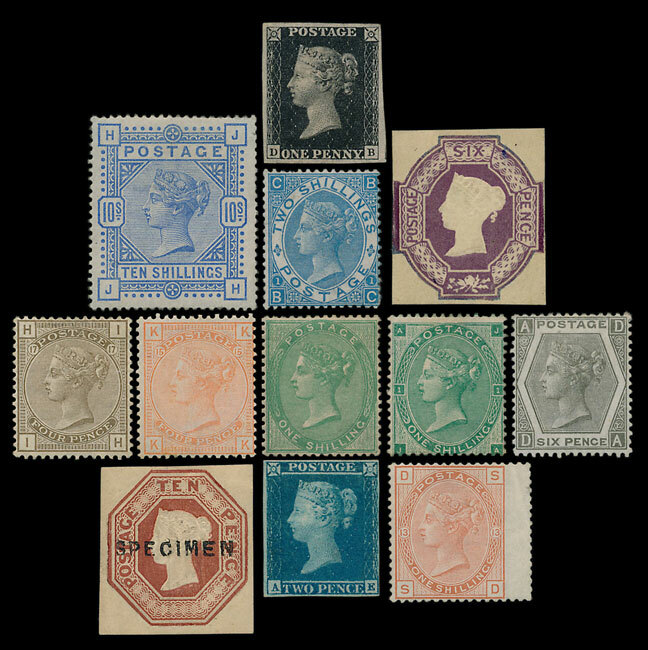 Stamps on covers in various forms were particularly popular, with collections often selling for two or more times the estimate. An ‘exceptional & extensive’ collection of 1971 Strike Mail, estimated in the auction catalogue at £1,500, struck a chord with bidders, realising £5,310. Similarly, an unusual collection of Canadian semi-official Airmails flew up to £3,070, an accumulation of 4000+ Polar Exploration covers achieved £2,600, and, on a smaller scale a handful of Soldier’s Mail sent from Bechuanaland to Essex in the late Victorian years sold for £540. 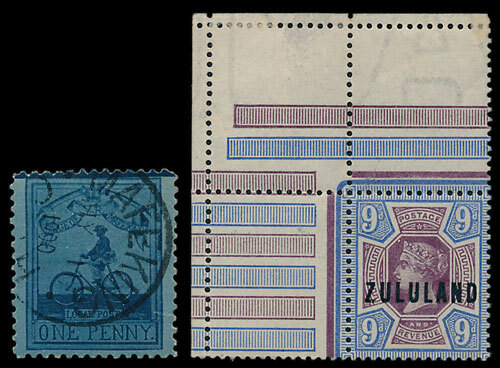 On the theme of British African territories, a Siege of Mafeking 1900 Bicycle 1d with an excellent cancel sold for £177 and Zululand values including a 9d corner marginal sold for £295. In the Foreign section Asia was again the centre of attention. An extensive China collection, covering the Early period and also with a good range of PRC and later, easily surpassed the estimate of £1,400 to reach £5,310. A pair of unidentified Communist period stamps, offered on their merits, achieved a remarkable £1,475, almost 15 times the estimate. For some years Japan has been in the shadow of the Chinese behemoth, though there was heavy bidding for some Japanese collections in the auction. An extensive range in 13 volumes, estimated at £600, sold for £2,360 and a collection of revenues estimated at £500 sold for £1180. 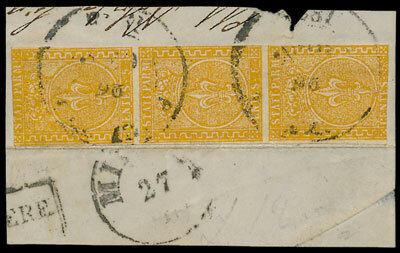 Some attractive early Italian multi-colour covers & other items were in the auction and though not all sold, a strip of 3 Parma 1853-5 5c was snapped up for £260. Almost every lot in the Great Britain section sold. A collection of Queen Victoria mint issues, with an estimate of £500, sold for £11,500. 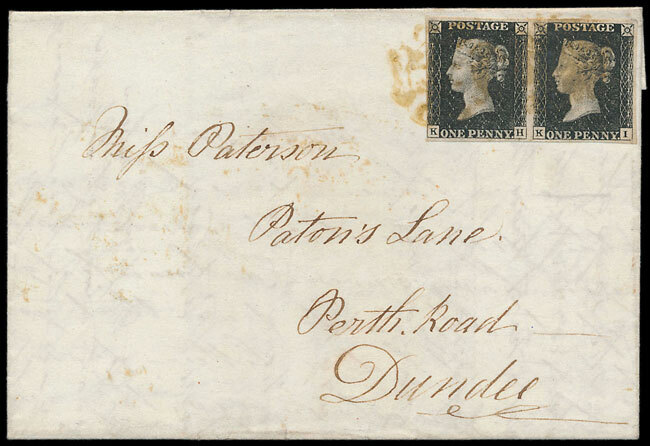 An 1840 cover with 1d black pair sold for £340. 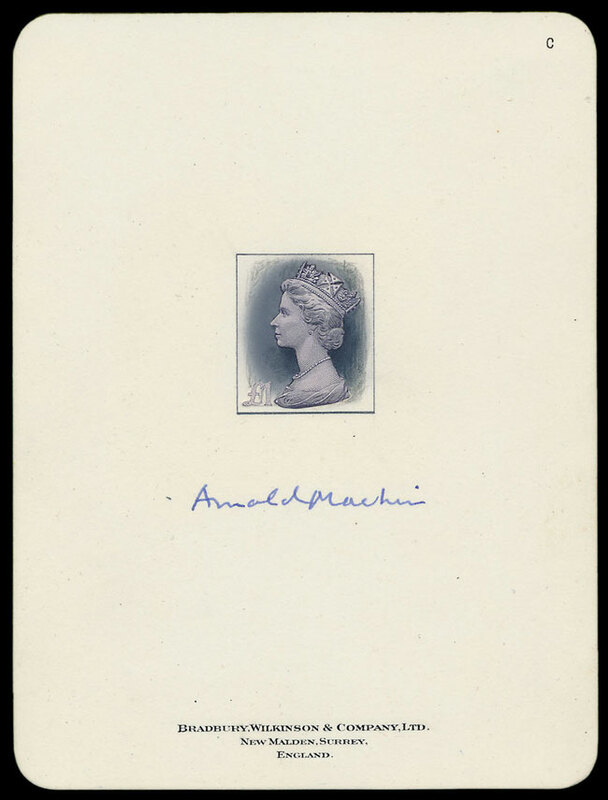 A very rare trio of Arnold Machin signed cut-out trials on cards sold for a very impressive £3540.